If you feel like a god as you walk around the various sculptures and arrangments that make up Craig Porter's installation at Le Gallery, it's probably not just because of your over-inflated ego. Miniature structures mounted to the floor and walls give you the feeling of being a giant, and the subject matter suggests even greater ecclesiality. Structures come up from the floor like oilrigs at sea, but instead of refineries we see 19th century smokestacks that belch thick black plumes into the air. At eye level on one of the walls a zeppelin, symbol of great sophistication, class and imperialism in the 1930s, docks with a bridge made of wood and bones. More hideous smoke pours from a golden gateway as a sheep heads towards the zeppelin. All around power lines connect pieces of this sprawling installation to one another and somehow you feel that the disasterous state of this world before is your own creation. Or rather, maybe it's all your fault. The show is called Galapagos (Paradise Lost I), referring both to the pristine archipelago Charles Darwin felt perfectly demonstrated his theory of evolution, and to Milton's epic poem which describes how the bearer of light fell from grace due to ambition and arrogance. Is it any wonder there are so many sheep hidden in those plumes of smoke? 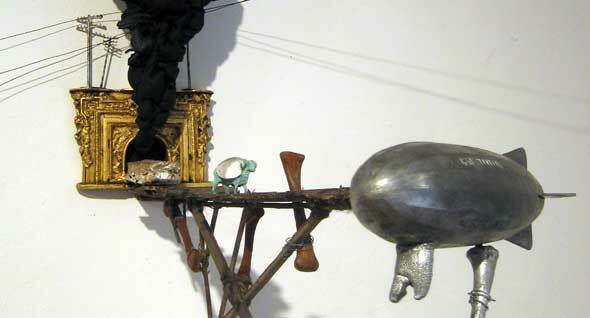 The point is pushed further by the use of toys and models for the basis of the sculptures. Toys being eternally innocent and models the building blocks for the best laid plans. The amount of detail in each piece is astounding and it's nice to see artwork that demonstrates real attention to each element of the art. Porter has clearly put a lot of thought into what this installation means, how it should be constructed and what it looks like. I've seen far too much work that looks cool but means nothing, or means a lot but doesn't communicate. This does it all and it's amazing. Galapagos (Paradise Lost I) is on until July 1 at Le Gallery 1183 Dunas St. W.